Data Center Rack & Enclosure Market size was valued at over USD 2 billion in 2017 and will grow at a CAGR of over 10% from 2018 to 2024. Rapid growth in the number of businesses globally has led to a rise in the number of facilities to efficiently store and process information. Digitalization across all verticals, such as IT & telecom, BFSI, healthcare, manufacturing, retail, and the government, is encouraging the demand for sophisticated cabinets. A large amount of data being generated has propelled the demand for innovative networking equipment for the data to be stored, thereby providing an impetus to data center rack & enclosure market. The rise in the adoption of high-density cabinets coupled with the growing importance of cooling, power, and efficiency has stressed the need for efficient cabinets. Initially, the focus on cabinets was limited with cost and size being the only considerations during the deployment. However, several colocation and managed hosting providers are implementing systems that can house more number of servers per unit area thereby increasing the capacity of the infrastructure. The hardware segment is anticipated to witness a high growth rate of around 12% in the overall data center rack & enclosure market owing to the increasing focus of infrastructure manufacturers on the miniaturization of hardware. High-density networking server applications are demanding an infrastructure that can mount a combination of different equipment and support high-capacity cable management and airflow in a flexible and efficient design. Several vendors in market are focusing on engineering the cabinet systems that optimize the airflow and limit the cable density. Moreover, the rise in the server processing power and virtualization is enhancing the infrastructure capabilities by allowing multiple applications to operate on a single server. New server designs are facilitating more servers to fit into a rack. These refurbishments have led to increasing power densities of each rack thereby generating more heat. The need to manage airflow and heat is causing a rise in the demand for innovative cabinets, thereby providing an impetus to the market growth. The trend of colocation is gaining traction owing to various advantages offered by the collocation providers. 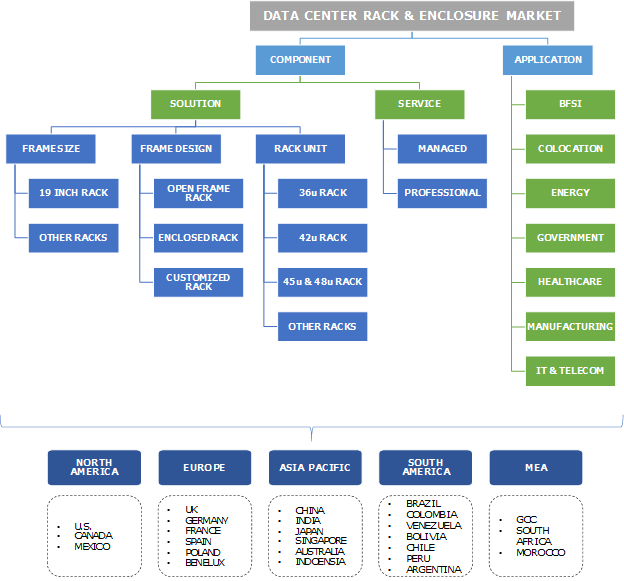 The colocation data center rack & enclosure market accounted for approximately 23% of the revenue share in 2017. There is an exponential rise in the amount of data generated from the increasing number of SMEs, which is generating a demand for scalable and reliable facilities that provide low installation and operation costs. Constructing a new facility drains the company’s labor, time, and money, owing to which colocation has become a feasible option for several SMBs that have budgetary constraints. Colocation vendors offer sophisticated maintenance and services to businesses to maximize the productivity and also enable the enterprises to focus on their core business with improved data management. The increasing amount of data generated has also led to the need to expand the existing facilities thereby taking up space on the premises. The rising trend of cloud adoption has eliminated the requirement for exclusively-owned facilities. 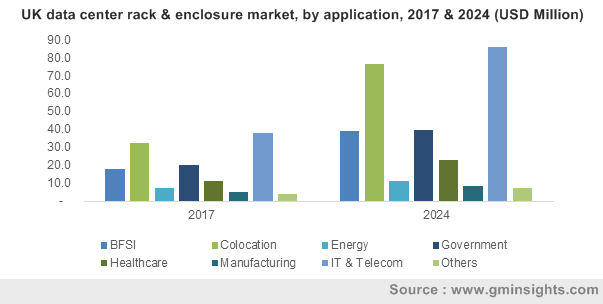 The demand for colocation services from the healthcare, BFSI, manufacturing, IT & telecom sectors is projected to aid the data center rack & enclosure market growth in the coming years. South America data center rack & enclosure market is anticipated to witness a substantial CAGR of nearly 9% over the coming years. The rising trend toward the adoption of the data centers across South America is aiding in the strong overall growth of the industry. There are around 88 colocation facilities in several prime locations across the region. In the recent year, the region has experienced a spike in the colocation infrastructure construction with the major portion of the industry dominated by Brazil. This high demand is largely due to the high benefits that it provides such as cost savings, better connectivity, and improved compatibility with the business. Moreover, the telecommunication sector is boosting the overall data center rack & enclosure market in South America. The region is witnessing rising internet consumer base, thereby fueling the demand for enhanced data storage facilities. Several companies are constructing new facilities to cater to a large consumer base. For instance, in 2013, IBM announced the launch of a new facility in Chile that is designed for infrastructure solutions and services including cloud computing and big data analytics. Key players operating in the data center rack & enclosure market include Schneider Electric, Rittal GmbH and Co. KG, Eaton Corporation, Dell, Hewlett Packard Enterprise, and Emerson Electric Company. Companies are trying to launch new solutions to expand their industry presence globally. For instance, in July 2017, Excel Networking Solutions announced the launch of cabinets that are specifically designed for the requirements of colocation providers. The need to handle the increasing amount of data is forcing companies to focus on the R&D of this equipment. In May 2014, Eaton announced the launch of its ePDU third-generation rack power distribution units with technological advancements that include grip feature for International Electrotechnical Commission (IEC) connectors. Competition among key players to launch innovative solutions will aid the data center rack & enclosure market growth. Moreover, companies are developing and manufacturing their own facilities and are incorporating the latest technological advancements into their hardware infrastructure. The growth in the number of businesses and the rise in the amount of data generated have led to the demand for upgrading and modernization of several outdated facilities. Efforts to renovate and expand the existing infrastructure will encourage the data center rack & enclosure market growth. Vendors are incorporating advanced technologies such as remote monitoring into racks. There is a rise in the demand for sophisticated solutions from several verticals such as healthcare, government, and manufacturing sectors. Several government initiatives, such as Digital India, are favoring the advent of digitalization across various domains thereby leading to the mounting pressure to handle the growing data efficiently. Companies operating in the data center rack & enclosure market, such as Vertiv Co., and Schneider SA, are stressing on offering optimized rack systems that integrate computing hardware, peripherals, and power management technologies in the infrastructure.